LedZeppelintickets.com promotes an exclusive opportunity to own a piece of Led Zeppelin history: its collectible, 20th anniversary numbered Led Zeppelin Hindenburg collector’s verification certificate with an original memorabilia ticket in the mezzanine section of the now demolished Chicago Stadium. 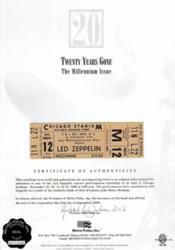 LedZeppelintickets.com is promoting an exclusive and rare opportunity to own a piece of Led Zeppelin history: its limited edition 20th anniversary numbered Led Zeppelin Hindenburg collector’s certificate with an original memorabilia ticket in the mezzanine section of the now demolished Chicago Stadium. This exclusive package includes a hand signed numbered custom certificate issued by the President of Metro Pulse on antique parchment stock, the original documented purchaser of all the original tickets accompanied with 1 mezzanine ticket. This limited edition collectible spans the best of both worlds, an original Led Zeppelin memorabilia item and an original Chicago Stadium item. The package allotted for this promotion will be released on a first come first served basis with no individual limits on quantity while supply lasts and each individual purchase (including multiple entries for individual purchases in quantity) will qualify to win a signed Robert Plant promotional photo from the 1980′s. The photo, black and white and 5 by 7 size, is accompanied by a forensic examination certificate featured here verifying it’s authenticity. Follow us on Twitter (@ledzeptickets) and Facebook (LedZeppelintickets.com) for updates and more information.